A beautiful & scarce antique advertising display of the absolute highest quality. A rare survivor in the finest solid mahogany, the upper section features four tiers & the base a single drawer, all featuring a different gilt advertising embellishment. 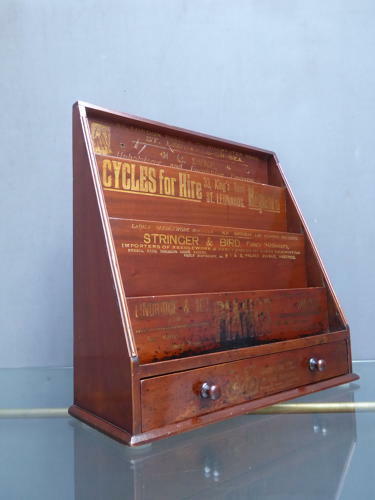 The piece originates from the Hastings & St Leonards On Sea area of the South Coast of Great Britain & the advertising includes a piano makers, cycle repair & hire stores, a stationers & an upholsterers applied in a diverse range of typography. Wear commensurate with age, excellent condition overall.